Meniere’s disease can be extremely disabling. One of its major and most annoying symptoms is vertigo. Vertigo is the sensation you are rotating around the objects in your environment or the objects in your environment may appear to be rotating around you. There is always a component of spinning to vertigo. Children often like to spin around and around until they fall down or spin around on a merry-go-round until they feel dizzy. As adults, this is not so much fun, especially when you are driving a car or climbing a ladder. It can be quite a frightening feeling and may be related to an accident you were in that caused the bones of the neck to misalign. We will discuss possible causes later in this article. First, let’s learn some more about Meniere’s disease. 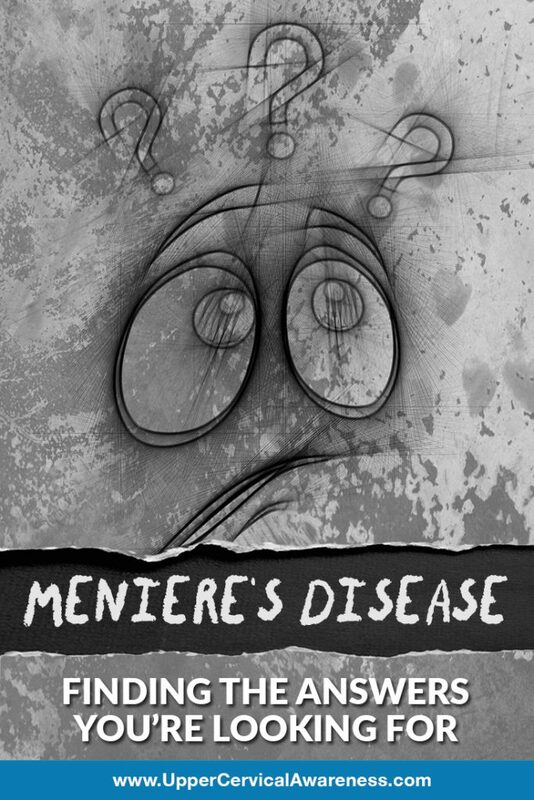 Meniere’s disease was discovered by a French physician, Prosper Meniere, in 1861. He theorized that the symptoms associated with this condition — tinnitus (ringing in the ears) and hearing loss along with vertigo — were coming from the inner ear rather than the brain, as most people believed at the time. As his theory became more and more popular, his name became associated with this and other inner ear balance disorders. Meniere’s disease in an inner ear disorder thought to be caused by an excessive amount of fluid that is normally present in the inner ear. The fluid of the inner ear is held in a structure similar to a pouch, called the endolymphatic sac. The fluid here is constantly being secreted and reabsorbed to maintain a particular amount in the ear. If the amount of inner ear fluid production increases or there is a reduction in reabsorption, the fluid builds up and causes an increase in pressure. It not really known why this occurs. It is most often seen in people in the age range of 20 to 50 years but can be seen at any age. There are specific symptoms that Meniere’s is known for. Most commonly it is the onset of sudden, unprovoked, severe, and disabling vertigo along with nausea and vomiting. Most people refer to vertigo as being dizzy, but vertigo from Meniere’s is much more than that. The symptoms can last anywhere from 1 to 6 hours. Rarely, they can last for up to 24 hours. Before and during an attack, you may feel fullness or pressure in the affected ear. Hearing in this ear will fluctuate but progressively becomes worse. Tinnitus may be constant or come and go. It may be worse before, during, or after an episode of vertigo. Usually, only one ear is affected by hearing loss and tinnitus. Hearing loss is most noticeable in lower sound frequencies. Meniere’s disease is little understood. Each person experiences it differently. One thing that all have in common, however, is that the symptoms can be explained by a nerve pathway originating in the upper cervical spine. If the top vertebrae of the neck are moving in an abnormal way, the top two vertebrae in the spine can hinder the flow of information through the nerve pathways controlling the tonicity of muscles that connect to the Eustachian tube. Sufferers of Meniere’s disease also complain of a horrible feeling of a clogged ear impacting their hearing and triggering this condition. This may be why more flare-ups are seen during allergy season. It is not that the allergies are the cause of Meniere’s disease, but rather they act as an irritation to the already stressed eustachian tube and intensify the symptoms of Meniere’s disease. So, what is it that is impacting the nerves connected to the eustachian tube? Doesn’t it make sense if that can be corrected, then the symptoms of Meniere’s should begin to subside? Why is Meniere’s constantly being hyper-tonic rather than relaxing and allowing the body to react normally? Evidence and repeated case studies seem to point to a trauma to the head or neck being to blame in the majority, if not all, cases of Meniere’s disease. A study was performed involving 139 patients diagnosed with Meniere’s disease. All of them recalled having some sort of cervical trauma before the onset of Meniere’s disease. Most of these traumas included whiplash injuries or vehicle accidents. Upon further examination, all 139 patients had evidence of a misalignment in the bones of the upper cervical spine. It took an average of 15 years from the time of the accident or injury to the onset of Meniere’s was noticed. After receiving specific adjustments for each individual case, 136 noticed a significant improvement in their Meniere’s symptoms, specifically vertigo. There is plenty of evidence proving the neck joints of someone who has had a trauma do not move properly. This is the result of tight cervical musculature reducing joint and cervical spine range of motion. These injuries can include whiplash, slips and falls, and sporting injuries. If the C1 and C2 bones are not moving properly, they negatively impact the input into the central nervous system. This can lead to all kinds of problems in the body, including Meniere’s disease. Upper cervical chiropractors use a gentle method that encourages the bones of the spine to move back into place naturally, without the need to pop or crack the spine. It is accomplished through specific low-impact adjustments to the precise area where the misalignment is located. Once this is accomplished, many people see a relief in their symptoms of Meniere’s disease.